This thesis is part analog, part digital, and part material research. Although the efforts of contemporary architecture and technology have attempted to be much softer, this softness has only been applied visually or to shells/membranes in form. This thesis is about literal softness. 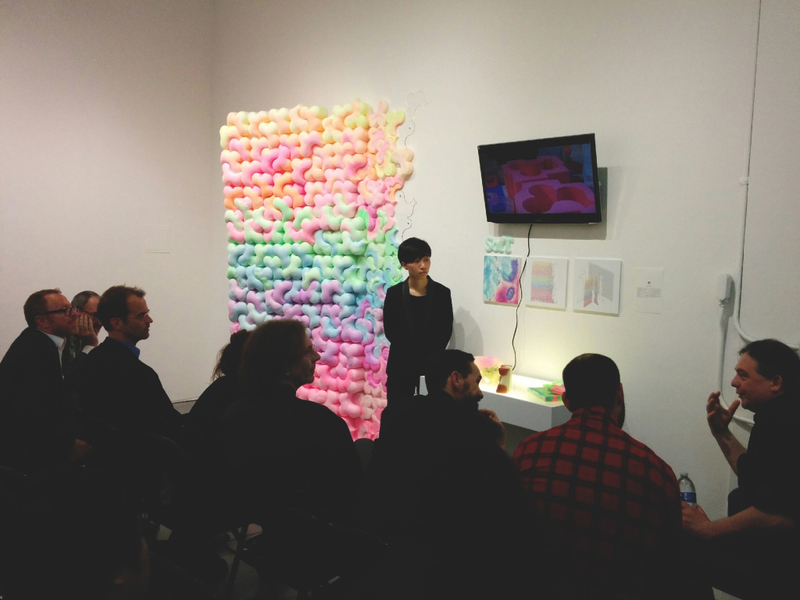 It is intentionally open-ended, as a set of explorations into the size, shape and color of softness. It begins with soft “built-ins” and then moves through scale changes to the tile and the pattern. 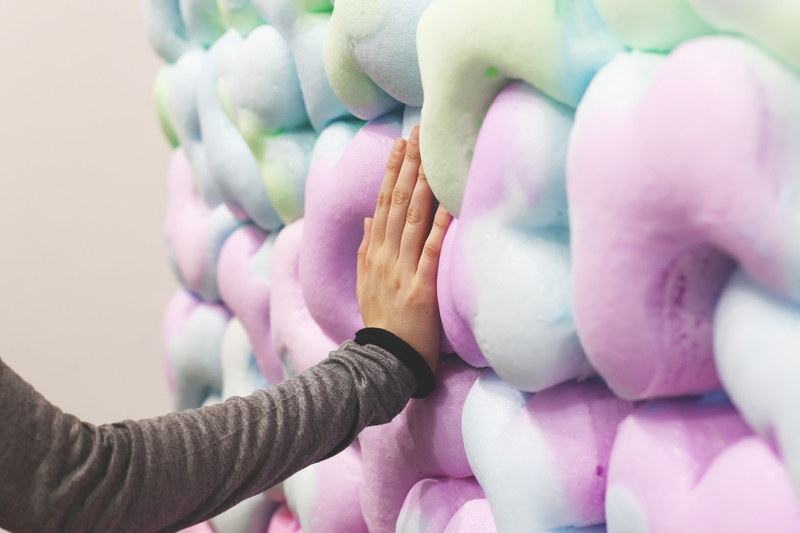 Using polyurethane foam, that can be cast in shape with color, or with color applied, this thesis seeks the irregular structures of soft materials in order to form aggregated wholes – walls, surfaces and interiors that will delight the eye and the touch. Exploring the various shapes that the cast foam offers new tectonics of softness. My thesis title is Soft, with a capital letter T, to emphasize the sense of touch. 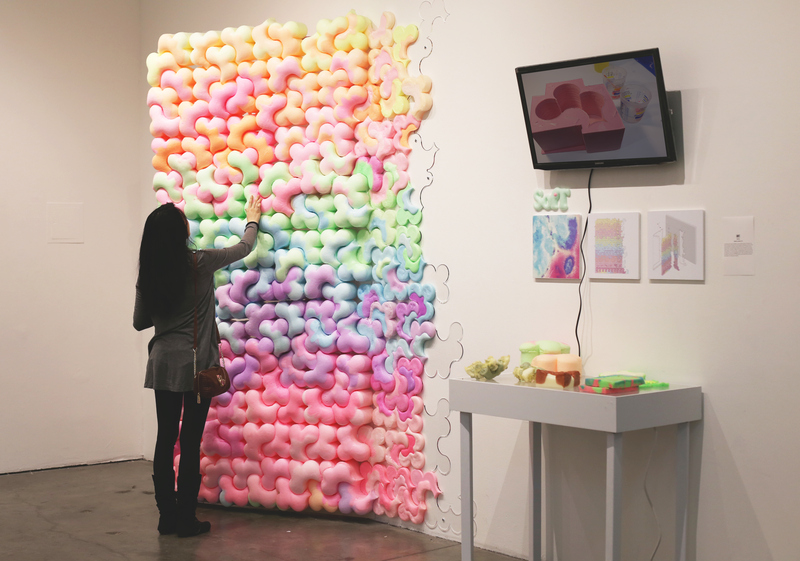 This thesis is an open-ended material speculation which centers on literal softness, by using polyurethane foam that can be cast in shape with color, or with color applied; this thesis seeks the irregular structures of soft materials in order to form aggregated wholes – walls, surfaces and interiors that will delight the eyes and the touch. Softness is available as a way to make solid form both visual and textile, it could create what hardness could do, like making bricks and tiles. In comparison to a lot of recent architectural projects, for example, Elena Manferdini’s MoCA installation, rather having complete control from the digital to material form, this thesis is embedded in what the materiality will do. With the foam material neither the brick or the tiles have to be rectangular, because the soft shape doesn’t have a certain pattern, the material agonizes over being constrained in the given form, it extends and escapes naturally beyond the mold. This creates unexpected textures, bubbles and puffs. In other words, the geometry of any one part cannot be completely modeled and predicted digitally. The aggregation of wholes from these parts is a logical next step. 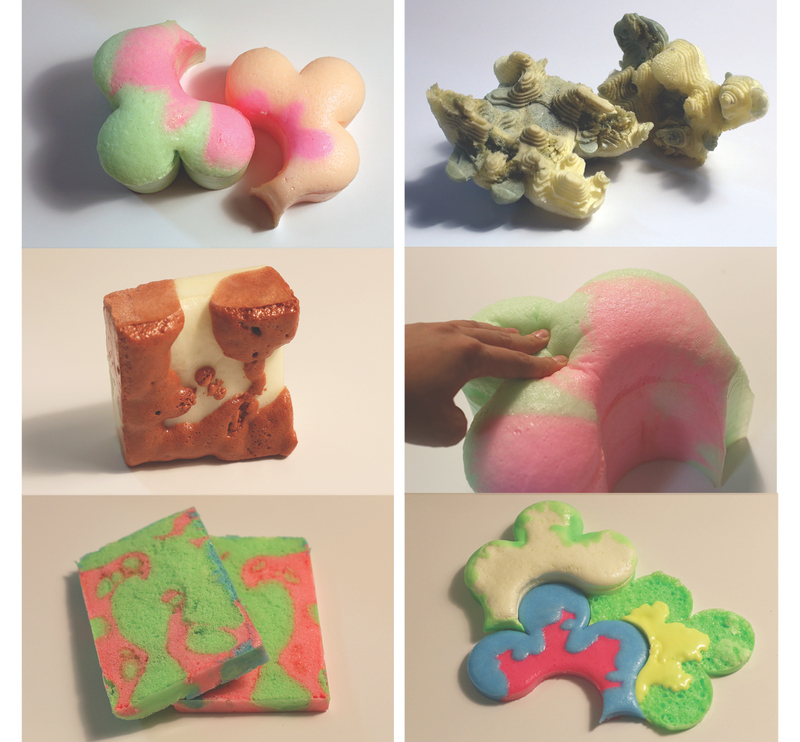 At one time, I imagined softness as a continuous entity, like a built-in, but more investigation into larger-scaled soft elements revealed how they were actually aggregates and assemblies of smaller pieces. Initial experiments with the foam material brought forth the lobed form, because an orthogonal shape would not remain flat. I had to cut the rectangle in addition, as opposed to the lobed form which popped right out of the mold. Any time, I met a resistance like that, it yielded information. In this case, the module of the foam wanted to be rounded. Space, forms and shapes could be revealed in different proportion and scales, but the physical senses couldn’t, therefore, this project attempted to create a piece work with one to one human scale. By stacking foam pieces together, (point to the puff wall) just like brick’s tectonic, to demonstrate Soft material is capable to be part of architectural element, the wall, a divider. This act of stacking and fitting the pieces together began to yield more information. 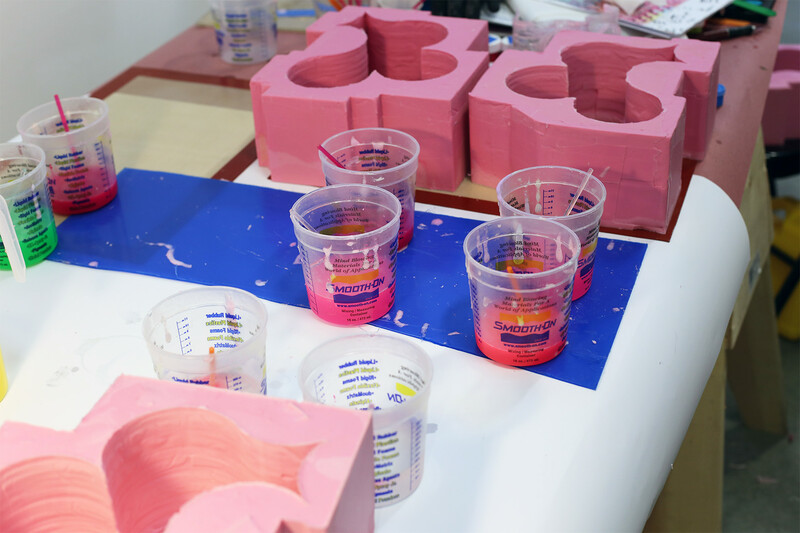 Each piece here was casted with the same amount of raw foam material, same technique same base pattern, and same amount of pigments applied. But still, the variety of the outcome is speaking for the mutinous characteristic of foam. 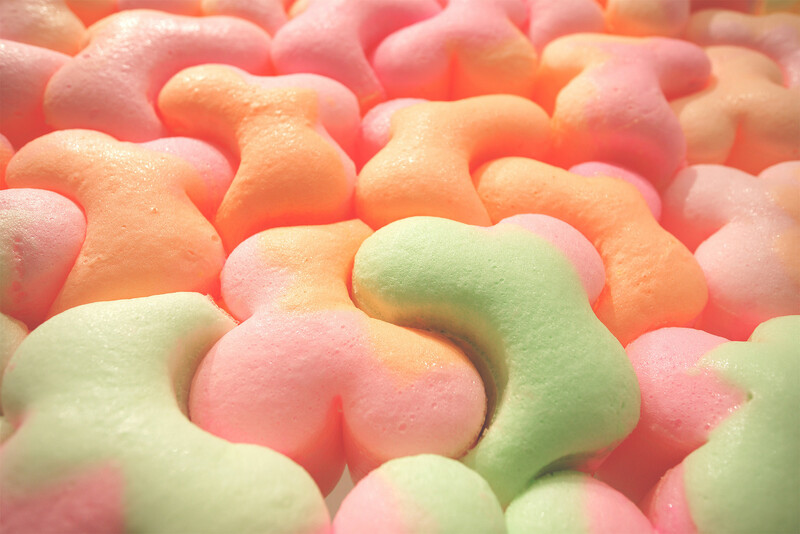 Foam expended by absorbing the surrounding atmosphere, the growth is natural and non-artificial. This thesis delights in this aspect of the materiality. 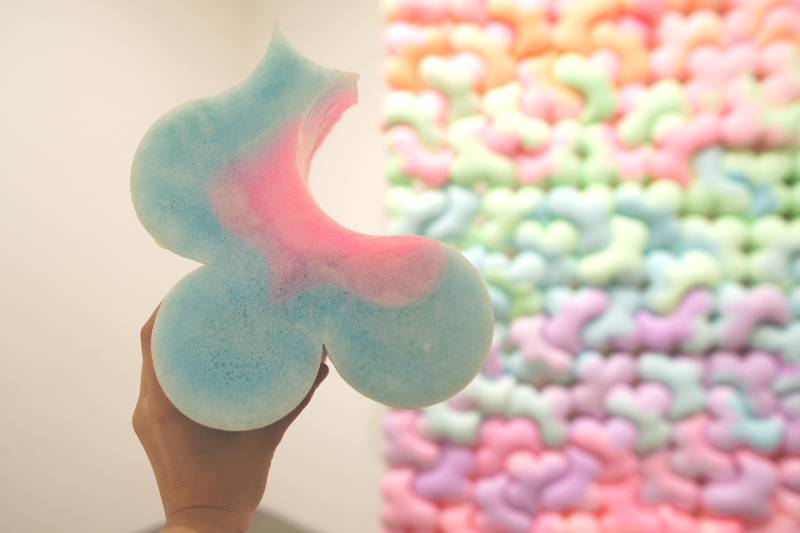 Each piece has two colors, mixed from two types of foam. Each piece has a base color and a secondary color but the spread of the colors was unpredictable. Some came out more pink, others more orange. So, I began modeling an assembly logic based not on pieces fitting together but on their color gradient, so that the overall effect was one of moving from color to color across the wall. This also enhances the human experience of touching and perceiving. Unlike traditional rigid building material, foams are able to directly interact with human body. It could be apply architecturally with infinite possibility. This open-ended material speculation speaks to a more interactive culture we live in and allows for a new tectonics of softness.